Salads, yes please! I love making salads, pretty much everyday for my lunch or dinner, to be honest I always tend to mix all the ingredients I find in the fridge. For dressing I use natural or greek yogurt mixed with garlic, oregano and thyme. The best mix ever! Taste so good. I also tend to always add chicken breast to make the salad more filling. This week was really intense for me, been working out for the whole week, I only had Saturday off. I am pretty impressed as overall my body is becoming a lot more stronger than it was at the beginning. My weight have been stuck in place for a while now, but the inches are going away, so I guess that's a good thing and you can't always trust your weight machine. This week I lost -1lbs, I am still very happy. Can't wait for it to get a little bit more warmer as I would like to get back into running, so far I been loving using the Cross Trainer for my cardio, running is my next goal. From next week I will focus this series mostly on one topic, to make it less about "me". That salad is making me hungry! 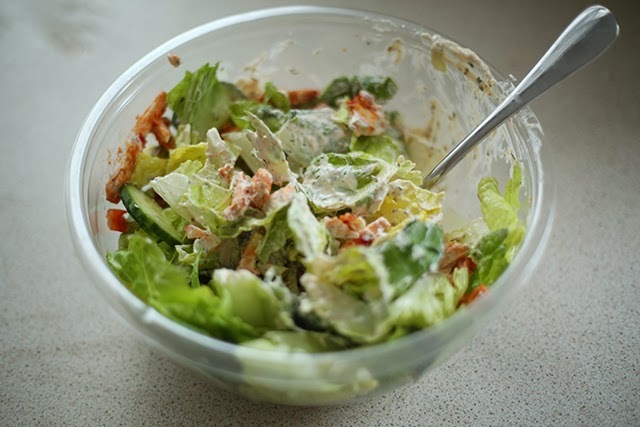 I love adding tuna to my salads, so yummy! Congrats on losing the weight! i love making salads (especially fruit salads) they make me feel so good! Beautiful blog, newest follower :) Great series! I think posting weekly about fitness helps to stay regular with it. I am actually eating a salad right now haha It's really not about weight lost but really about the inches, so great job for shedding those inches! Gaining muscle will acutally make you gain weight! A couple weeks ago I ran every day of the week, but sadly, I haven't been able to keep it up since them because life gets so busy :( I really hope to run again though!